We Stood Like Kings are a Brussels-based post-rock quartet who specialise in re-imagining scores for silent films. 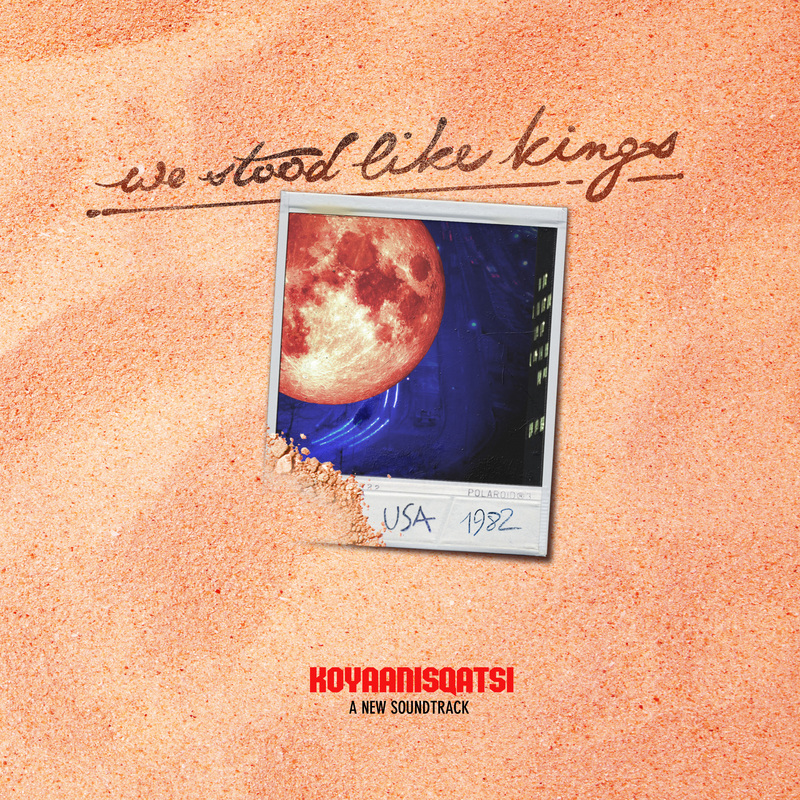 Their upcoming album, USA 1982 (out 22 September 2017 on Kapitän Platte), was written to accompany American cult movie Koyaanisqatsi, directed by Godfrey Reggio. The film explores the imbalance of nature when mankind takes over. The original film was scored by Phillip Glass, so Judith Hoorans explains why her band decided to write music to fit something that already has a soundtrack. Hi Judith. How are you? Hi Joseph. I’m absolutely fine, thank you. Happy to be here! Tell me about your personal musical journey. How long have you been playing piano and when did you first discover post-rock? I started playing piano as a child. My parents really wanted their three children to have a musical education, so we didn’t really have a choice. I first learned violin, before figuring out it wasn’t really my cup of tea. I remember being very afraid of my teacher. Then I switched to piano. It’s only later, in my late teenage years , that I became conscious of how much music meant to me and that I could do something worthy with it. It’s about at the same time that I discovered post-rock through a good friend of mine. The first band I really enjoyed was Caspian. How did We Stood Like Kings come to exist? I’ve known Mathieu, our drummer, since a very long time. We were both students at the same boarding school in Aalst, a little Flemish town located between Brussels and Ghent. Our supervisor loved music a lot and even provided us with a rehearsal room. We started writing pop songs, playing covers. A few years later, we had lost sight of each other but met again by chance, almost literally bumping into each other at university. That’s when I let him hear some post-rock, and he was totally up for it. We started a new band, and over the years, We Stood Like Kings took shape with Colin on bass and Phil on guitars. Who is your favourite film director and why? I don’t really have a favorite film director. I’m not a movie know-it-all, I like to enjoy good movies and I don’t really watch them the way that I like listen to music (which I do in a more professional way, you might say, paying attention to meter changes, tonalities, etc.). The best movies for me are the ones which make you forget all the things you have to take care of. What process does We Stood Like Kings go through when deciding which films you’d like to cover? Of course we watch a lot of movies, and at some point, it becomes obvious which one we should choose. I guess we discussed the choice of Koyaanisqatsi for like, 5 minutes. Our second project for Vertov’s A Sixth Part of the World was a bit more tricky, because we knew that the movie was a difficult one and would raise many questions from the audience due to its political nature. One your website you include a quote from Godfrey Reggio that includes the sentence “Copies are copies of copies”. How well do you think this applies to your current project? The way I would interpret your question is that in my opinion, nothing is ever really new. We are all different but identical at the same time. Though I would say that we have consciously chosen a musical direction that was different from Philip Glass’ approach. Bands are always inspired by other art forms, be it music or other kinds of art, and there are always many others doing stuff that’s close to what you do. The only way to make it really personal is to put all your soul in it. Trying to create something to really resonates within you. Therefore you have to find what’s yours and not someone else’s and use it as your strength. You’ve covered Berlin, USSR – two lost empires. And now you’ve chosen the USA. Was that a conscious decision? Yes definitely. We had the idea of making a kind of trilogy on the subject of fragile empires. BERLIN 1927 is like a snapshot of Berlin right before the outbreak of World War II. USSR 1926 shows a glimpse of the Soviet empire at the height of its power. It was only logical to focus on the USA, the Western lifestyle and how it came to its actual form thanks to the technological evolution of the last decades. How knows how it’s going to end? How does copyright factor into what you do, seeing as you are playing music to match other artists works? We certainly have to handle copyrights. The two movies from the 20s are still protected by what you call “screening rights”, which we have to pay for each screening of the movie to the Film Museum who has restored to movie and commercialized it on DVD. For Koyaanisqatsi, we have made an agreement also. Of course it’s never free to use existing movies and one should be really careful about this to avoid bad surprises. Have you ever received feedback from people who were involved in the films you write soundtracks to? And were you in contact with Phillip Glass at all during this process? Well, not for our first two albums obviously, because the people who made them are dead now. We have not been in contact with Philip Glass. But we have recently sent our soundtrack to the directing team of Koyaanisqatsi. We are eagerly awaiting their feedback, that’s the least we can say. Last year was the anniversary for the battle of Somme. I watched a documentary about it which was filmed during the the battle, and a live orchestra played the score in time with the film. Do We Stood Like Kings do something similar? Yes, it’s what we do. We play live, below the screen, while the movie is playing and we are synchronizing our music with it. Of course there’s just 4 of us and not a whole orchestra! This work has taken We Stood Like Kings a whole year to write. Talk me through the writing process. Of course the first step is to choose a movie to work on. That took us quite a long time, as we had to watch tons of silent movies before finally coming across Koyaanisqatsi. But it was love at first sight. Once the choice is made, the next step is to watch it over and over again while trying to decide which overall mood fits in which part. Of course you have to split it up in different parts, and that might be a bit tricky as we have to take into account the fact that the album’s going to be released as an LP (which can’t hold more than around 20 minutes per side). The musical writing process itself has taken us about a year. It’s a kind a puzzle really. You’ve got ideas and you have to make them match the length of the movie scene you are working on. We can’t just let ourselves be carried away by the music. Some songs were very easy to write, other have taken us months. I think one of the oldest songs we started working on, “Night Owl”, was one of the last songs to be finished. We just tried out dozens of different versions of that one before we felt satisfied. The album features 11 songs. Had you considered writing a seamless, feature length track instead? In fact, the album is divided into 11 songs but live, they flow seamlessy into one another. I think it’s much easier to fit in today’s standards to have separate tracks. Movie soundtracks released on CD are also always divided into tracks. You recently featured one of your songs from the upcoming album on the Open Language Volume II comp that our friends at A Thousand Arms put out. Has this help you reach a new audience? Yes, we definitely reached new people by being on the compilation. We were also thrilled by the review from Heavy Blog Is Heavy. They seemed to have enjoyed the track a lot. How are you feeling about the upcoming tour you have planned? Obviously we are incredibly excited. We just came home from the first 6 shows of the tour. These shows were a kind of test because we’ve added a new light show to our set. Technically, there were a lot of new things to take care of, but it was a success and we’ll carry on that way for the whole tour. We’re super happy to visit a few new countries and cities we’ve never been before, like Ljubljana in Slovenia for instance. We’ve planned several shows in Eastern Europe too, for which we got help from Colossal Bookings. Were looking forward to these as well. The message of this silent film is implict, rather than overt. Post-rock and instrumental music in general is also often up to the listener’s interpretation. Do you feel confident that your music matches the themes of the film well enough? Of course, you can’t discuss taste and it’s up to every single person to decide whether our music fits the themes of film. Obviously, we hope that we succeeded to give the movie, which we love so much and has influenced so many directors, a new breath and approach. Our goal is not to try to replace Philip Glass, we simply were so touched by the images that we wanted to express musically the feelings that the movie had stirred in us. After a show, a woman has written us that she felt our music was more hopeful than the original soundtrack. That it made her believe that our world might still as well be saved. Because if there is no hope, there is no point, right? You are planning on releasing this album on CD and vinyl, as well as digitally through Kapitän Platte. Do you think the music is best listened to on its own, or with visuals supporting it? I think we wanted to make music that both would stand on its own and mix up with the screening in a way that wouldn’t be too disturbing for someone wanting to “watch a movie”. For me, the ideal setting for this project is a venue with comfortable seats, a big screen and a nice stage. It’s really meant to be half-concert, half-screening. If people just want to see a movie, they should go to the movies, not the a movie concert. I guess the balance changes in every venue but we definitely don’t hide behind the screen. We Stood Like Kings are currently touring Europe to promote USA 1982. Head along to www.westoodlikekings.com and click “shows” for more information regarding dates and locations.